The Larson Electronics EPL-LP-24-LED Low Profile Explosion Proof light fixture provides operators with a powerful and energy efficient alternative to traditional hazardous location luminaries. LED technology and compact design makes this lamp an excellent replacement upgrade option for bulky and high maintenance cost older fixtures. This explosion proof LED light has a T5 temperature rating and carries a paint spray booth, ATEX and IECEx certifications, and is approved for use in United States, Canada, Europe, and Asia markets. It is ideal for applications such as paint booths, oil rigs, offshore applications, petrochemical, manufacturing, chemical storage, water treatment centers, and food processing plants where a where flammable gases, vapors, or dusts exist or stand the potential to exist. The EPL-LP-24-LED is equipped with terminal strips for wiring. This Class I Divisions 1 & 2, Class II Divisions 1 & 2 low profile explosion proof light fixture provides 5,400 lumens of high quality light while only drawing 40 watts. The copper free aluminum alloy body is powder coated for added durability and an attractive aesthetic appearance. Special heat dissipating design in conjunction with LED technology helps this fixture to achieve an excellent 60,000 hour rated lifespan with 80% lumen retention at the 60,000 hour mark. Light weight and a low profile make this unit an attractive alternative to larger and heavier older fixtures and requires less hardware to install. 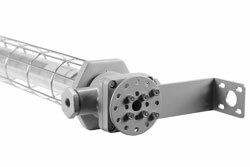 The EPL-LP-24-LED from Larson Electronics is an integrated low profile linear explosion proof LED light fixture with a unique design. Instead of using diffused glass, optics, or reflectors to distribute the light, Larson Electronics has positioned the boards within the fixture to provide a wide area light without sacrificing quality or light output. Two offset LED assemblies within the fixture allow this explosion proof linear lamp to provide a brilliant 100° horizontal beam spread and 140° vertical beam spread while achieving a 5,400 lumen output to maintain a small form factor. The LED assembly is protected behind a tempered borosilicate glass tube that is protected by an aluminum wire guard to prevent from accident damage to the light fixture. Measuring only 5" in width, this fixture takes up half the surface area as a standard two foot 2-lamp explosion proof fixture. The surface mount fixture`s overall height with adjustable surface mount bracket is under 4.5", including the surface mount bracket itself, making the EPL-LP-24-LED one of the lowest profile explosion proof light fixtures on the market. When compared to our EPL-24-2L-T5HO fixture, the EPL-LP-24-LED fixture produces twice the light output while taking up less than half the surface area. The EPL-LP-24-LED is an ideal for applications with little space where low profile fixtures are required. This light is universal voltage capable and is offered in multiple voltage configurations: 100-277V AC 50/60Hz for standard electrical circuits and 12-24V AC/DC for low voltate circuits. We also offer 347V AC and 480V AC single phase configurations of this LED light. This explosion proof LED light fixture is IP67 rated, dust-proof, and protected against high pressure jets and temporary submersion. The cast aluminum body and LED lamp give this light excellent durability and resistance to vibration and impacts. The housing is specially designed to dissipate heat which increases the efficiency and lifespan of the LEDs and electronics. Wiring: These LED light fixtures are equipped with terminal strips. Electricians bring customer supplied wire to the terminal strips on the fixture for power connection. The wiring of these terminal strip equipped units must be conducted via wiring methods laid out in NFPA 70 / NEC Code Book Article 500. This unit is a factory sealed fixture. This LED light produces 5,400 lumens with a color temperature of 5000K and a color rendering index of 75 which produces colors and details much more accurately than high pressure sodium or mercury vapor luminaries. We also offer a 3000K warm white and 4500K natural white color temperature options (longer lead times may apply for non-standard temperatures). The EPL-LP-24-LED is offered with pendant or surface mounting options. Adjustable Surface Mount Brackets: Each L-shape bracket is machined with three holes per bracket to attach to the light fixture. The angle of the bracket is set by aligning the machined set screw holes on the mounting bracket with with index holes attached to the fixture. The bracket itself is mounted via two bolt hole at the top the bracket. There are two brackets, one on each end of the light. Once the brackets are mounted to a surface (ceiling, floor or wall), the light fixture can be removed from the brackets by removing the set screws that hold the bracket to the mounting bracket and adjusting the fixture. The fixture can be adjusted at 15° intervals. 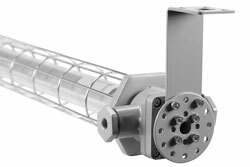 Suspension Mounting: Pendant mount fixtures hang from the conduit and are suspended by rigid pipe. 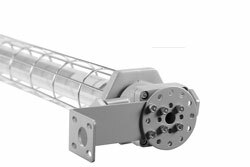 Each fixture features a 3/4" NPT junction box on one end, and a eyelet other end of the fixture. Operators bring rigid pipe down to the threaded mounting hub. Customer provided wiring is fed down through the rigid pipe to the junction box and tied in to the fixture`s terminal strips, completing the electrical connection. Chain Hang Mounting: Chain hang mount fixtures hang from the chains or metal rope. Two eyelets, one at each end of the fixture, allow operators to attach safety hooks to the fixture during installation. Operators bring flex conduit down to the threaded mounting hub. Customer provided wiring is fed down through the flex conduit to the junction box and tied in to the fixture`s terminal strips, completing the electrical connection. Suggested Applications: Paint spray booths, aircraft maintenance, oil drilling rigs, refineries, solvent and cleaning areas, gas processing plants, chemical manufacturing, waste water treatment plants, gas processing plants, offshore applications, oil tankers, mud tanks, sand mines, mining, cold weather applications. 4. Fixture constructed of die-cast,corrosion resistant, copper free aluminum alloy with epoxy finish. 5. No ballast box. No ballast to replace. 6. Superior color rendering compared to HPS, LPS, MH. 7. Retains 80% lumen output after 60,000 operating hours. 8. Powder coated aluminum fixture body. 9. Mounting Options Include Surface and Pendant. 12. Lighter weight, slimmer, brighter alternative to fluorescent configurations.